An issue with SQL Server 2012 SP3 was identified that impacted EF4/5 due to additional datatypes in the dll. To easily identify the available dll versions of sql server, I ran a quick adhoc bat file. 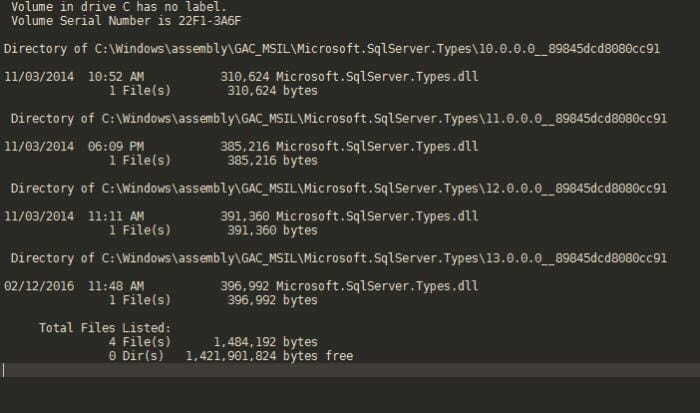 A post in technet mentioned that the DLL shipped with SP3 could cause these conflicts and if the uninstall didn’t clean up the GAC correctly, problems could occur with Entity Framework calls.